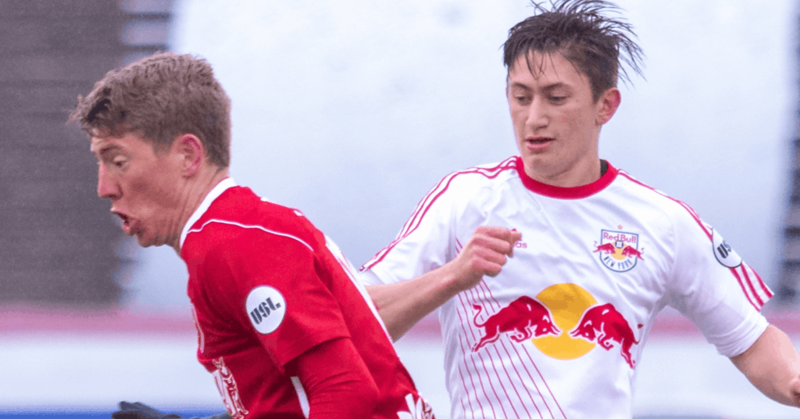 RICHMOND, VA — (Saturday, April 7, 2018) — The Richmond Kickers (1-2-1) settled for a draw against the New York Red Bulls II (2-1-1) Saturday night at City Stadium. Brian Shriver scored his first goal of the season off a free kick in the 17th minute. José Aguinaga leveled the score for Red Bulls II in the 69th minute set up by Cristian Cásseres, Jr.
New York had a chance early in the match from a free kick outside the Richmond box. Stefano Bonomo tried to control the ball and turned to play the ball away as Yudai Imura stepped in and was slightly late on his tackle as the referee whistled for the foul. Andrew Tinari and Cristian Cásseres stood over the ball, while Cásseres took the kick going wide left of the goal. Brian Shriver broke the deadlock in the 17th minute from a free kick chance. Scott Thomsen received the ball as he was making a run towards the New York box from Yudai Imura. Benjamin Mines tried to make the stop as he tripped up Thomsen, giving the Kickers the free kick just to the left of the goal. Shriver stepped up to take the free kick, going to the top left corner of the goal, hitting the underside of the crossbar to put the Kickers up. Travis Worra came up with a massive save in the 30th minute to keep the lead for Richmond. Ethan Kutler fed the ball up the field as Stefano Bonomo was turning to make a run towards goal. Losing his footing, Bonomo was able to turn and avoid Koby Osei-Wusu and set up a shot that went straight to the hands of Worra. Andrew Tinari looked to sneak in a goal just before halftime for New York. Hassan Ndam controlled the ball inside the box. Unable to turn towards goal, he laid the ball off to Tinari at the top of the box. He was going for side the right post as Worra dove to push it away from goal. Raul Gonzalez looked to double the Kickers lead in the 58th minute. Koby Osei-Wusu found Gonzalez on the edge of the New York box. As he was going to take the shot, Gonzalez was fouled by Jordan Scarlett and drawing a yellow card on Scarlett. Gonzalez took the free kick, shooting low and to the right of the keeper as Evan Louro dove to make the stop. New York would level the score in the 69th minute from José Aguinaga. From the right side of the field, Benjamin Mines was able to pick out Amando Moreno inside the Richmond 18-yard box. Moreno took a touch to leave it for Cristian Cásseres. He took a one time shot that Travis Worra tipped away as Cásseres pounced on the rebound. Turning back towards the middle of the field, Cásseres picked out Aguinaga as he took two touches to control and shot towards the lower right corner and into the back of the net. Richmond came close to netting a second goal in the 81st minute through Raul Gonzalez. Brian Shriver took control of the ball in the midfield and had Gonzalez ahead of him. Shriver quickly tried to feed the ball through for Gonzalez as Jordan Scarlett tried to get a touch on the ball. Gonzalez got to the ball and had a chance on goal that went just wide of the target. With a minute left before stoppage time, Benjamin Mines from the right side of the field near the corner played a cross into the box, finding Jared Stroud near the penalty spot. He went for a quick, low shot that Worra dove to stop. Richmond hit the road next Saturday night, April 14 as they travel to the defending USL Champions Louisville City FC for a 7:30 p.m. kickoff at Louisville Slugger Field. WTVR CBS 6 will air the match on their 6.3 sub channel (Comcast 206, Verizon FiOS 466) and streaming online through ESPN+. The Kickers return to City Stadium for Happy Hour Wednesday, April 25 as Toronto FC II come to town for a 7:00 p.m. kickoff. Tickets for that match are on sale now at RichmondKickers.com.